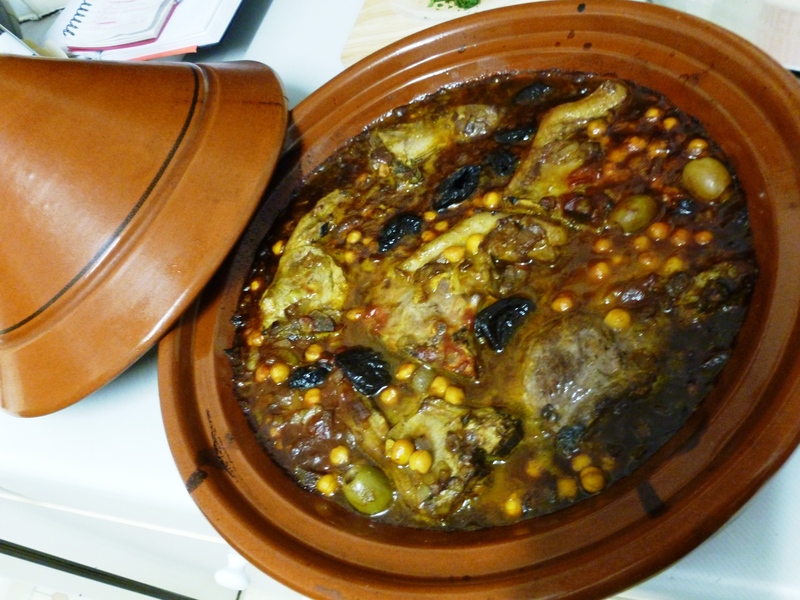 Last night, with my flatmate working late, I decided to cook a tasty tagine. I’ve had a tagine for a couple of years – they’re great and I love Moroccan food. I’ve got a really good Moroccan cook book but last night’s recipe came from the Giraffe cook book that I was given for my birthday this year. (That is the cook book for the restaurant chain Giraffe, not a book on how to cook giraffe meat. I just wanted to clarify that in light of the ongoing horsemeat scandal!) It’s a great little cook book full of interesting ideas. Tagines normally involve slow-cooking but by using chops in this recipe it reduces the cooking time. My tagine is used exclusively in the oven. There are some tagines that you can use on the hob but I don’t want to chance it – I’d hate to crack it, especially as it was a Christmas present. Soon after getting it I bought a special heat diffusing ring that would allow me to use it on the hob. The first time I used the ring there was a terrible smell of paraffin and the kitchen was rapidly filled with acrid smoke which set the fire alarms off! I’ve never used the damn thing since and it just sits in a drawer of rubbish and old batteries in the kitchen. These days I tend to start tagine recipes off in a frying pan or large saucepan on the hob to brown the meat and get any liquids boiling and then I transfer everything to the tagine and stick it in the oven to cook. I’ll present the recipe as it appears in the book and then annotate the changes I made in order to use my tagine. The recipe is supposed to feed 4 people, allowing two chops each. I usually cook it for two of us allowing three chops each. Mostly ‘cause Sainsbury’s sells lamb chops in handy packs of 6! ½ small red onion, peeled and diced. Season the chops and fry the chops in olive oil until nicely brown on both sides. Set aside. Add the lamb chops, chickpeas, olives and prunes and simmer for another 10 minutes. Add the lemon juice and stir in the coriander. Make the couscous in the normal way and leave to stand for 5 minutes. Fluff it up with a fork and then stir in the mint, tomato and red onion. *At this point I boil the stock/puree in the frying pan, add the chickpeas, prunes, olives and chops and then transfer the whole lot to the tagine and bung it in the over for 30 minutes at 200. It’s a rich, tasty recipe and really easy to do. And he fluffy, minted couscous was a nice, refreshing accompaniment to the rich, tomatoey main dish. It was easy too for Alberto to heat his half up when he got home. I don’t like olives so I left them all for him and had most of the prunes as he’s not that keen on them. Hi. My name's Neil. I live in Brighton with my flatmate (also Neil) and I work as a Librarian at a local college. I like cooking, eating and socialising with friends. Which is what prompted me to start this blog. I cycle everywhere around town - it helps to work off the calories! This entry was posted in Uncategorized and tagged Chickpeas, Cinnamon, Cook, Couscous, Cumin, Ginger, Lamb chops, Mint, Moroccan cuisine, Olive oil, Olives, Paprika, Prunes, Stock (food), Tagine, Turmeric. Bookmark the permalink.